Offering access to a variety of trails, including the Trans Canada Trail and Bruce Trail in addition to a number of within-park routes, Forks of the Credit Provincial Park sounded like an interesting place to visit, so we packed some snacks and headed out for our inaugural hiking trip of the season on a sunny June Friday. I had expected to find trail maps for pickup at the venue and so had not printed one off in advance; however, all that was available was a large board with the trails outlined on it, with no take-away copies. Another pair of hikers who passed by as we studied the board suggested taking a photo of it as a reference. This may work well for those who have a larger display window on their digital camera; in our case, it was a bit of help but not perfect. For the outbound leg of our trip, we stuck to the Trans Canada Trail. This provided good footing, and in most places was easily wide enough for two people to walk side by side. There are sign posts at each intersection, so if you know which trail you want to take, you should be able to find your way. The trail signs also indicate which modes of transportation (hiking, cycling, or horseback riding) are allowed on each section, which is helpful. On the day of our visit, we encountered mostly hikers. Two mountain bikers passed us, but the only sign of horses was a lone hoof print along the Meadow Trail. The terrain we passed through at the start of the trek was largely meadow with broad vistas and a few shorter trees. There was also a short side loop that provided a good vantage point for a view of the kettle lake below. 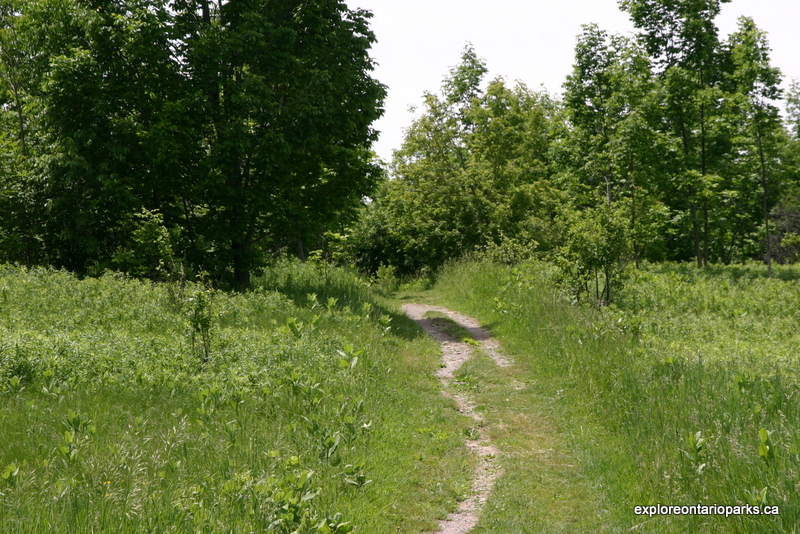 On the warm June day of our visit, small butterflies abounded in the low undergrowth beside the trail. While there were mostly skippers and wood nymphs, there were a few showy Tiger Swallowtails, one of my favourites. 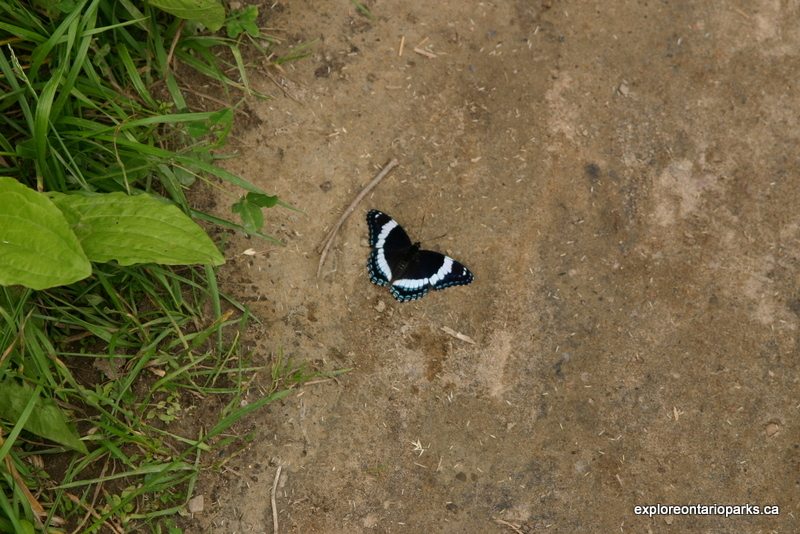 Most of the butterflies were too flighty to catch on camera, with the exception of a white admiral that was engrossed in collecting minerals from the dirt along the trail; he stood still for a period of time, showing off his white-bordered wings. Milkweed, the preferred food of monarch butterflies, was present in big patches, so hikers visiting later in the season should keep a eye peeled for monarch caterpillars or chrysalises. I saw my first adult Monarch of the year soaring past mid-way through the hike, so that was one of the highlights for me, as was the sighting of an Oriole perched near the top of a tree. 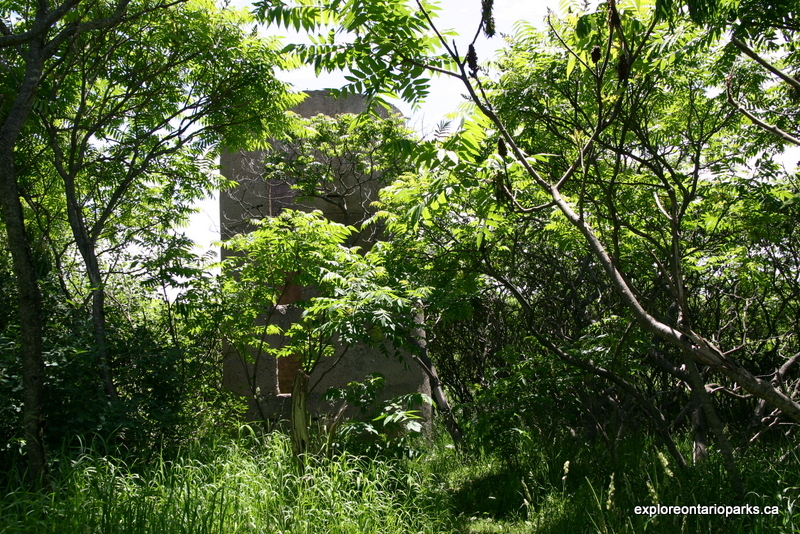 Some ruins bearing record of past settlement are visible along the hike; the remains of a homestead are visible on the hillside above the kettle lake, and we came across a large stone silo among a clump of sumac near the river. 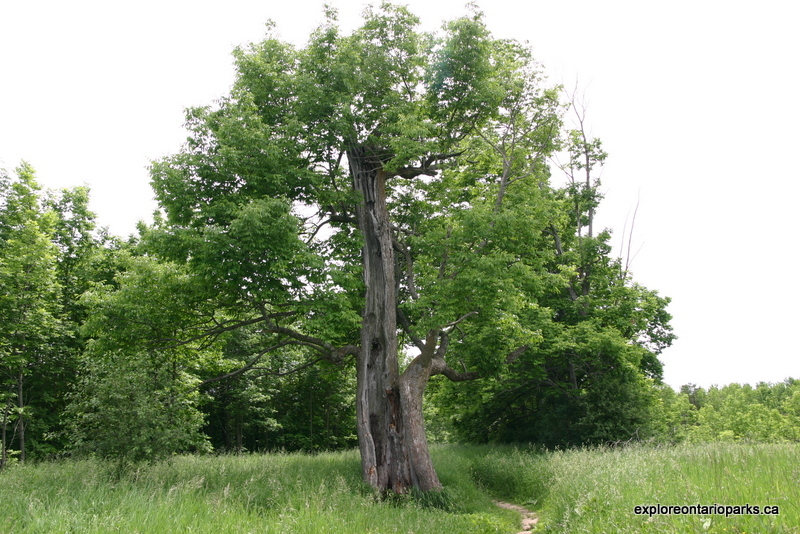 According to one of the park information boards, the township was surveyed in 1818 and after that time, the forest was converted to farmland through laborious effort–apparently it took 40 years to clear 20 acres around one of the houses. That gives one a sense of the backbreaking work that was involved! 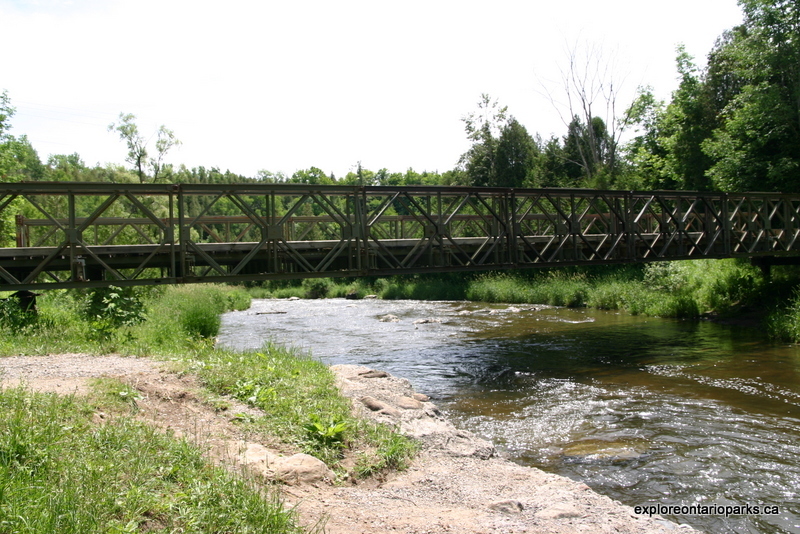 There was a more recent man-made structure along the way in the form of a “Bailey Bridge” spanning the Credit River. This sturdy bridge was built in 1999 as part of the “Bridges for Canada” project, a cooperative venture between the Trans Canada Trail Foundation and the Canadian Military Forces. The bridge takes its name from the original designer, a British military engineer named Donald Bailey. The bridge location also provided great views of the river, and a bench near the bridge was a convenient spot to stop for a rest and a snack. Without a map, we weren’t certain which way to go for a view of the waterfalls, which are one of the features of the park, so we headed back along the Trans Canada Trail and elected to take the Meadow Trail back to the parking lot. This stretch of the Meadow Trail was much hillier than the trails we had traversed earlier, but it was worth the effort as we saw some splendid old trees and had a view of the kettle lake from a different angle. 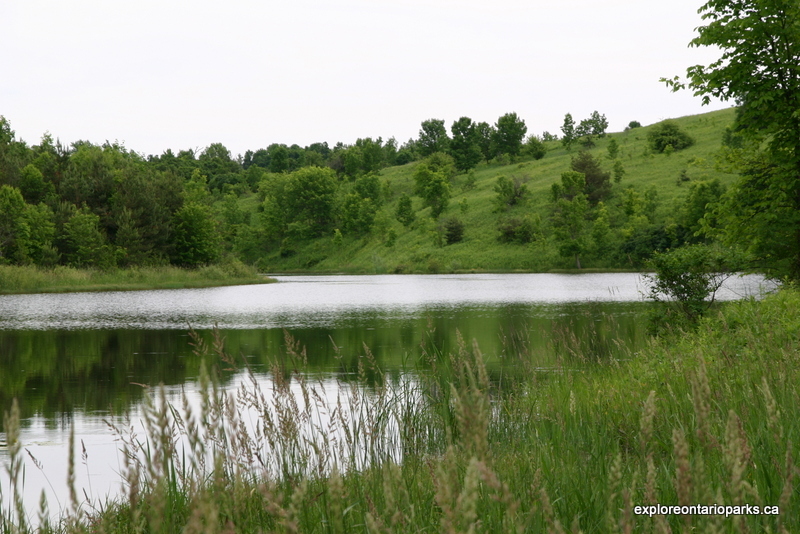 As we neared the lake, frog calls could be heard, and we saw a flicker flitting past. While we had seen several dragonflies elsewhere on the walk, it was near the small foot-bridge–a sharp contrast to the large Bailey Bridge–that they really abounded. After another hill climb, we were within sight of the parking lot. 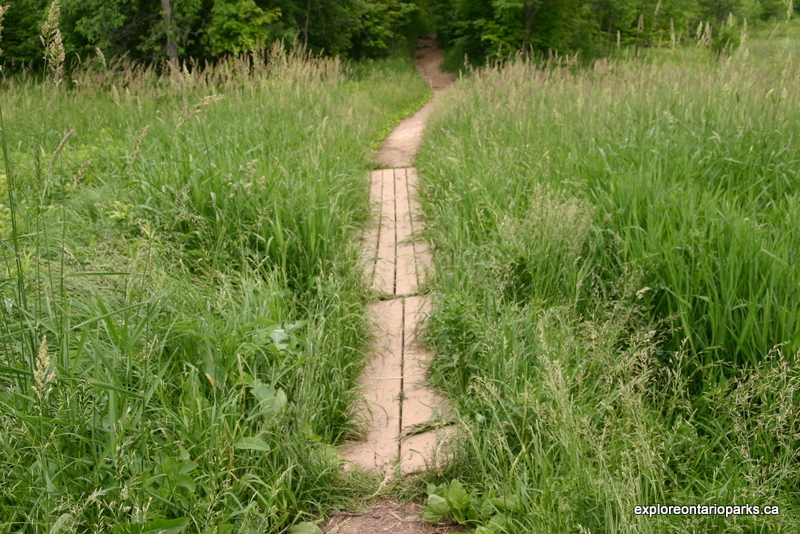 While the Meadow Trail was not difficult from a technical viewpoint, hikers who have difficulty with knee or hip joints might find it a long haul. The Trans Canada trail sections we traversed earlier, for example, were definitely easier going. Some of the reviews I had read online noted that the park can get busy on weekends, particularly in the fall colour season. This seems to be backed up by the presence of an overflow parking area. However, we were able to visit on a weekday and had no difficulty getting a parking spot; when we left around 3:30 p.m., there were only six other vehicles plus a motorcycle in the main lot, and the overflow parking was blocked off. 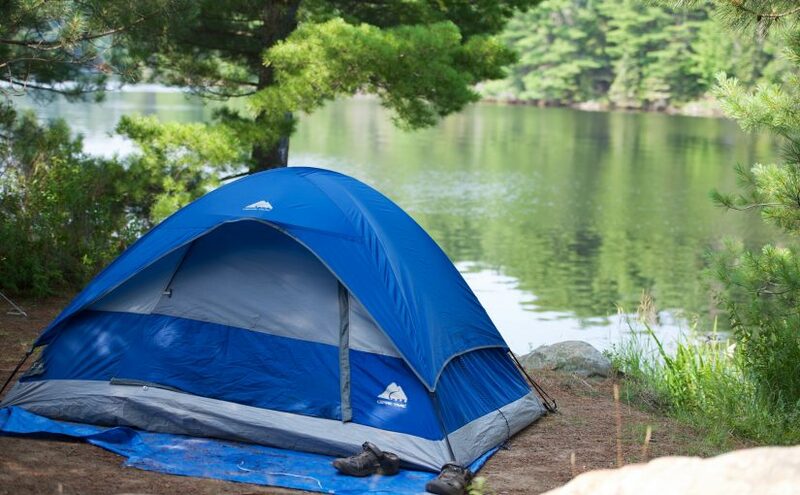 Located near Caledon, Ontario, not far north of Toronto, Forks of the Credit Provincial Park won’t provide you with a wilderness experience. During our walk, airplanes could be heard overhead from time to time and there was periodically the sound of heavy equipment operating in the distance. However, there was plenty of nature to enjoy in the form of trees, flowers, birds, dragonflies, butterflies, and a small garter snake that darted off the path and into the woods. Birdcalls abounded, reinforcing my resolve to study my “Birding by Ear” CDs when I get a chance. The river is picturesque, as is the lake, and the park is available year-round, for day use (no camping) only. All in all, we felt it was worth the visit–but next time, we’ll print out the map and bring it with us! I’d brought change for the parking ticket machine, and based on the advance research I did online I was expecting to pay around $11, so I was unpleasantly surprised to find that the meter called for $14 for a full day. However, by toggling through the menu I also found a 2 hour option for $5.25 and a four-hour choice for $7.50–so I’d definitely encourage users to ensure they check out all the options. I took the four-hour pass, which left us time to spare.